When Jerry left the Navy we settled in Northern Virgina. We found a church we loved and settled into to stay. The parish welcomed us with open arms. They took to our little family and we were so happy to be loved and returned it in kind. We had decided to homeschool Jonathan before we left Virginia Beach. Courtney went to school so she could receive all her therapies and this way I had one on one time with Jonathan. It was a gift to me, to walk along side my son as he learned about history, literature and religion. The science and math part were his favorites. I hated them and relied heavily on videos and a local tutor. Time went on and our family began to heal for all the medical trauma and stress it has caused all of us, especially Jonathan. He had been through so much in the last six years watching Courtney go through all of the tests, surguries, hospitalizations and so on. He hated doctors and when someone came toward him wearing a white coat, he would take a step behind me. It ate away at me that we were constantly having to choose between our children and their needs. Jerry and I were stretched financially and emotionally. Courtney’s seizures were still a daily occurrence but we had gotten used to them. We just went with the flow trying to achieve “normal” as best we could staying calm and working through whatever crisis came our way. We lived each day trying to anticipate what would come and be prepared but not scared. I thought we were all doing pretty well until Jonathan started to throw tantrums and talk back, every day, all day. His attitude was horrid and Jerry and I tried everything we could think of. We talked to him patiently, we sought counsel from our parents and close friends and finally we took him to see a counselor. I felt like such a failure as a parent. I felt like God was making me choose between my kids. I couldn’t win no matter what I did. One morning I went into Jonathan’s room to tell him to get up and ready for the day. I noticed he had blood on his pillowcase and all down one side of his head. I stayed calm and asked what was wrong. He said his ear had been hurting for the last few days but it didn’t anymore. I made sure he was not actively bleeding, helped him dress and gathered Courtney and we headed to the ER. Sweet gracious Lord. Help me in this moment. He was ten years old and making choices no child should have to. I broke a little right there. I got down on my knees in front of him and assured him of my love and his fathers love. I told him that whatever was happening he should come and tell us, we would always be there for him. He looked me straight in the eyes and said “No you won’t Mom. Courtney will always need you more. Most days that’s OK, but sometimes it hurts so much I just want to die. I don’t want to hurt anymore.” Tears rolled down his cheeks and he hugged my neck hard. What is a mother supposed to do in that moment? What was I supposed to say to him to make the hurt go away? He had seen so much in the last seven years He had watched his sister fight to breathe time and time again. He had been in countless hospitals right by my side, watching everything that happened to his sister. It was too much for a ten year old to take in. I held my son as he cried. I closed my eyes and prayed to God to give me the words. 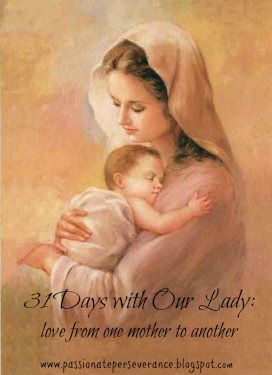 I asked Our Blessed Mother to infuse me with the maternal love she had for her Son, so that my son would know how loved and valued he really was. I told Jonathan how much we loved him, how proud his Dad and I were of him. I told him what a great big brother he was to Courtney and how God chose him specifically to be her brother. I told him how much she needed him and how much Dad and I needed him to be a part of our family, to help with God’s plan whatever it would be. Then I listened. I don’t think I had ever listened before. I had never asked if he was OK? Why didn’t I ask? What kind of mother was I? The questions poured into my brain and I struggled to stay in the moment with Jonathan. I continued to pray to the Blessed Mother as I battled my fear of losing my son right in that moment. I breathed deep. I leaned into that moment not knowing what would happen next, his emotions were so intense, and I was scared. I leaned into the knowledge I held in my heart that God was there with us in the fear and the hurt. I leaned into the knowledge that if we just stayed together as a family, we could weather this storm and come out stronger. I sat with Jonathan for what seemed like hours. I cried and he talked. He cried and I talked. I prayed throughout the entire time and finally we were all out of tears and words. I made him an ice cream sunday and he spent the next few hours building Legos. Yes, Jonathan was scared. Yes, his heart hurt something fierce. Yes, he had no idea what was going to happen. I was right there with him. Only God knew the answer and he wasn’t giving away any hints. I’m scared. My heart hurts. I don’t know what is going to happen. Will my child die? Do I have enough heart to love them both as they need to be loved? Will my other child resent the one who needs so much? What can I do? Help me Mother Mary. Help me to love without condition, without expectation of that love being returned or of needing it to be returned. Help me to know when to speak and when to be quiet and listen. Help me to lean into the Father’s plan for my life even if I don’t understand the why of it all. Help me to lean into today without fear of tomorrow. Jesus I trust in you.